Ice bin hook adapter allows the ice tote to attach to nearly any ice machine, reducing cross-contamination, ice spillage, and employee back strain, while improving efficiency. A suite of innovative, end-to-end integrated ice management tools designed to increase operational efficiencies while reducing food safety concerns. Reduces the risk of cross contamination and improves employee safety. The ice tote (patent-pending) features an angled top surface and pouring spout to reduce spills. Fits in most commercial dishwashers and includes a rear hang hook for upside down tote storage. Ergonomic comfort grip allows for safe transfer and ease of use. 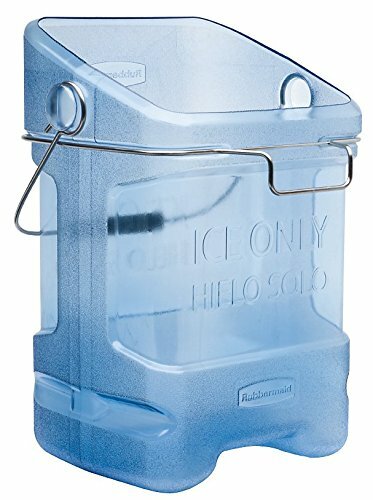 Ice bin hook adapter allows the ice tote to attach to nearly any ice machine, reducing cross-contamination, ice spillage and employee back strain, while improving efficiency. 25-lb. capacity. Commercial Zone Canpactor Recycling Container 30 gal.- Beige .